People queue to buy the newly published book by investigative journalist Jacques Pauw, at the launch of The President's Keepers, in Johannesburg, Nov. 8, 2017. The author of a South African book that sheds light on the unpopular president's illegal dealings has attracted anonymous death threats and spawned demands by the state security apparatus for it to be withdrawn. Unsurprisingly, that sent the book's popularity soaring in a nation plagued by high-level corruption scandals, leading it to quickly sell out and go into reprint just weeks after hitting the shelves. More than 1,000 people crowded into the mezzanine of a high end Johannesburg mall late Wednesday, full wine glasses in hand, to meet the author of South Africa’s latest literary sensation. Barely a week after its release, the book got a boost from two unlikely sources: the state security agency and the tax authority. The security agency last week sent a cease-and-desist letter to Pauw demanding that he withdraw his book in two days. When that deadline expired - and the book was breaking sales records -- they reissued the letter. The nation’s tax authority also said that they may seek to investigate Pauw for releasing confidential taxpayer information. Pauw also says he received a death threat this week. That’s because the targets of Pauw’s book are no ordinary mobsters and ruffians. Among the many explosive claims in the book are allegations the nation’s spy chief set up a parallel, shadow spy agency and poured nearly $100 million into it. Pauw also takes on scandal-tainted President Jacob Zuma, who Pauw alleges drew a monthly income of $100,000 during his first term, and did not report it to authorities. 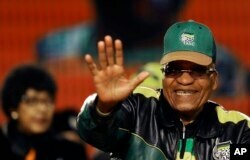 South Africa's ruling party president Jacob Zuma, waves during the African National Congress policy conference in Johannesburg, South Africa, June 30, 2017. Pauw stands by his claims. The book’s popularity, he says, stems from South Africans’ growing hunger for the truth. Scandal has dogged Zuma for years, and he has weathered eight no-confidence votes in parliament, due to the majority held by his ruling African National Congress. There are signs, however, that the powerful party, too, is turning on him, and all eyes are on the party’s political conference next month in which Zuma may be sidelined. Pauw’s publisher and booksellers are refusing to give in, calling the government agencies' demands “censorship.” They have also made light of the demands. “I must also thank our marketing agency, the state security organization, for what they have done to help us sell the book,” said Benjamin Trisk, CEO of the popular Exclusive Books chain, who hosted this week’s well attended launch, which ended early after the mall’s power suddenly went out and a backup generator also failed to work. Nicky Stubbs, sales and marketing manager for NB Publishers, says the book’s runaway popularity has shocked even the publishers. In its first days on the shelves, the title sold more than 16,000 hard copies and more than 5,000 e-books - a South African record. And, she told VOA, it’s not letting up. VOA called the ANC and the president’s office seeking their thoughts on the book. They did not answer our calls, and have not commented publicly.